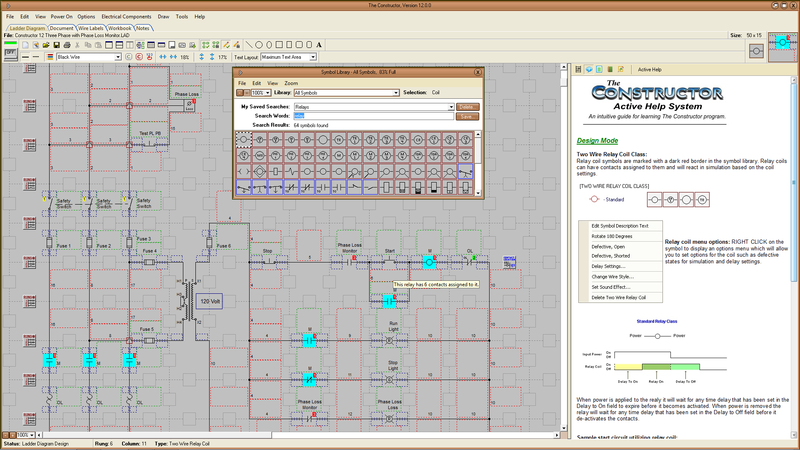 The Constructor 13 circuit simulator software is a great training tool for teaching troubleshooting. Free 60 day trial. The Constructor electrical drawing software is a great training tool for teaching troubleshooting! Draw ladder diagrams and electrical layouts much faster and easier than with most CAD software. The constructor makes the creating, testing, trouble-shooting, teaching and printing of electrical circuit diagrams, electrical schematics and electrical drawings fast and easy. Interactive on-screen help, manual and examples. Over 800 wire drawing symbols included (IC, NEMA and IEC Symbols), customize or create your own too. There is even optional PLC I/O wiring diagram symbols libraries for most PLCs (Over 1800 I/O modules) The Constructor started on DOS 23 years ago, now on version 13 for Win10, 8, 7, XP, where you can see the power flow and hear motors and alarms. (126 sound effects library) Take and display notes, even print electrical circuit simulations and electrical schematics diagram. Automatically add wire numbers to your diagrams, print wire labels, use Brady and other wire label printer manufacturer’s templates. Export to electrical wiring diagram PDF, or optionally to DXF, DWG, JPG, GIF, TIF or PNG. Latest feature, electrical simulation scripting for hands free simulations. Used by fortune 500 companies, schools and universities, electricians, contractors and various IBEW/JATC/UA/IEC training centers around the world. Download free simulator 60 day trial for free. Note: This is Not the spice simulation or circuitlab or a electronic circuit simulator.